A historic site tour takes you around one of the most charming historic districts in the Caribbean -- St. Thomas. Nelson&apos;s Dockyard was very interesting. While there are alot of steps and walking this tour was great because we did it ourselves. After beach we were left on the top of the city to check a few museums. After beach we were left on the top of the city to check a few museums. 99 steep steps was very difficult to go down. No assistance nor help. We had to find our own way back via walking or run down taxi. A few miles away from ship. Blackbeard&apos;s Castle and Historic buildings walk down the 99 steps. 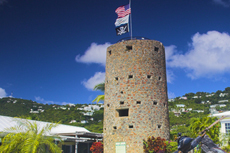 Blackbeard&apos;s Castle and Historic buildings walk down the 99 steps. Easy way to have a leisurely visit to Charlotte Amalie but probably could have done this for lower cost on own. When on Blackbeard&apos;s castle and shopping tour! Instead of shopping for hours, we independently walked up the 99 steps to Blackbeard&apos;s Castle. Instead of shopping for hours, we independently walked up the 99 steps to Blackbeard&apos;s Castle. Very cool. They had a docent dressed in pirate garb, who was very entertaining in the telling of his blackbeard tale. Blackbeard&apos;s Castle was nice. They did have sales people in almost every room we entered. We felt the pressure to buy the whole time we were there. We liked the Amber Museum, too. Black Beards&apos; Castle was very interesting, lots to see and rum tasting too. We have been to St. Loved it! I could have even swam if I had brought a bathing suit. It was blackbeard&apos;s castle. After the tour, walked into town. The visit to the St.
Nice ride around the island to Greathouse & Blackbeard&apos;s Castle.